Sprint review meeting: It's all about Marketing! It's not that the team hasn't done a great job! Quite the opposite. The teams I work with do miracles! But, like most engineers, they sell themselves short. Sprint Review Meetings are all about Marketing! Your team needs to sell the work done during the Sprint to the audience! Show the value of what you did: Don't explain how you did it, and don't go into excruciating technical detail about what you implemented... explain the benefits of what you did! 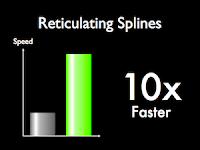 Do: "By improving the reticulating splines performance, customers have a much smoother checkout process"
Don't: "We improved reticulating splines speed by using a really smart b-tree structure"
Make a big fuss about what you did: Don't hide the great work you did in a bullet list with all the details of the Sprint. Pick 3 to 5 key points, and make a slide for each of them. Make a real world demo: Be smart with your seed data. Use real data whenever possible, or some really clever examples to make your demo more effective. Do: "Peter Smith bought a Mega Chair and paid it with a Visa card"
Don't: "Customer A bought Product 1 and paid with card X"
Talk about the entire Use Case: Even if you don't demo it all, explain how the user got to the point of the demo and what the user is trying to achieve. It will make understanding your demo much easier. Do: "Peter Smith was navigating at our web site to buy a chair. He did a search for chairs, and clicked the 1st result on the list. What you see here is the page present to him at that stage." Don't: "Assume Customer 1 is at this page"
Make a clean demo: The demo should be as near to reality as possible. Avoid launching the command line, use batch files, or employ other kind of odd gizmos during your demo. Don't dwell on what you didn't do: If your team made a commitment to this sprint that it wasn't able to keep, mention it, give a one sentence justification, and move along. Be prepared to answer any questions that may arise, but don't spend the time you have to talk about what you did, speaking about what you didn't do. What other tips would you add to this list? 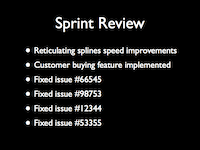 How do you turn your Sprint Review meetings into huge successes?